Undone kebabs... you heard it here first! 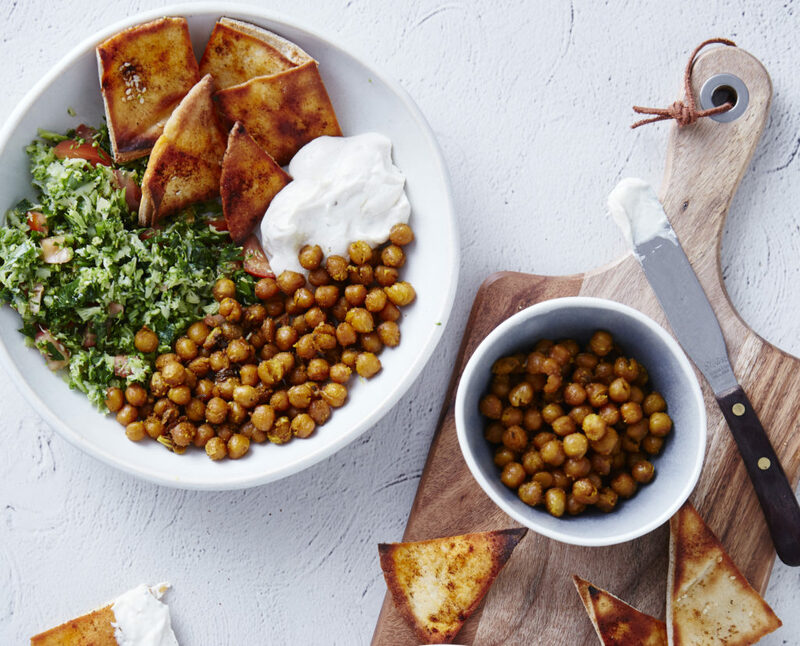 Think crispy spiced chickpeas, crunchy pita bits, broccoli tabbouleh and a special sauce! 2 cups cooked or tinned chickpeas. 3 tablespoons (45ml) olive oil. 2 teaspoons caraway seeds (optional). 3 medium pita breads, cut into triangles or rectangles. 1 tablespoon white sesame seeds (optional). 1 large head broccoli, grated. 1 bunch flat-leaf parsley, finely diced. 3 large tomatoes, finely diced. 1 lemon, juice and zest. 1/2 cup full-fat plain or Greek yoghurt. 1. Preheat a fan-forced oven to 220°C/425°F/Gas Mark 7 and line two baking trays with baking paper. 2. In large bowl, mix chickpeas, 2 tablespoons (30ml) of olive oil, garlic, cumin, 1 teaspoon of smoked paprika, turmeric and caraway seeds if using. Season with a little salt and pepper and spread across one of the lined trays. 3. On the other lined tray, lay out the pita shapes so that none are overlapping. Brush the top sides with olive oil using a pastry brush or the back of a spoon. Sprinkle with the remaining smoked paprika and sesame seeds, if using. Season with a little salt and pepper. 4. Place the tray of chickpeas in the oven and bake for about 20 minutes, or until chickpeas become golden. In the last 5 minutes, switch the oven to grill and place the tray of pita shapes in the oven too. 5. Meanwhile, in a large bowl, combine broccoli, parsley, tomatoes, 1/2 the lemon juice and zest and a drizzle of olive oil. Divide between 4 serving bowls. 6. Next combine ingredients for the Kebab Sauce with remaining lemon juice and zest. 7. Divide chickpeas and pita breads between the four portions and top with Kebab Sauce, to serve. Gluten-free option: Use gluten-free pita bread or swap out bread for cooked quinoa. Vegan/dairy-free option: Replace yoghurt with coconut yoghurt.